Logos Land offers 10 On-site Trailers for guests to rent. Our Trailer rentals offer the perfect opportunity to experience RV camping before making a decision to buy an RV. Each rental trailer sleeps up to 6 people and has a master bedroom, 2nd bedroom with bunk beds, kitchen table that folds down into a bed, living room couch, air conditioning, toilet, shower, and small tub, full kitchen with microwave and dishes, deck and barbeque. The rental trailers book up quickly, so we recommend booking early to avoid disappointment. **Please remember for rental trailers to bring your OWN BEDDING & TOWELS! 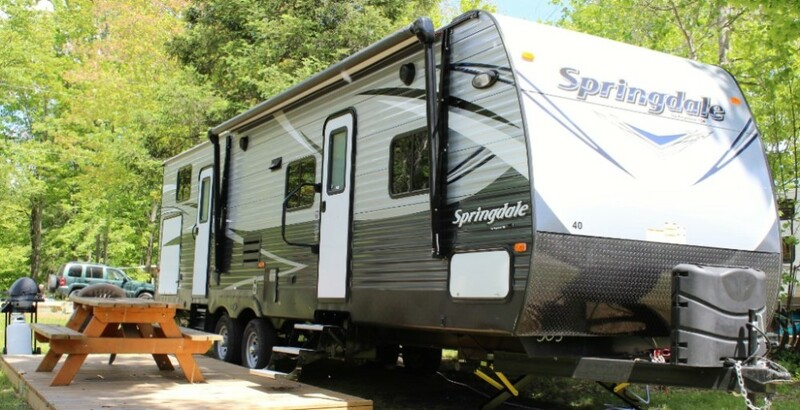 Our Rental Trailers provide guests with a camping experience. Our trailers are very comfortable (and popular), but different from a typical Motel experience. If you prefer motel type accommodation, we stronly recommend booking one of our luxury 1 or 2 bedroom suites.